Ask fellow campers about "Lafayette Park Campground" and nearby attractions. This is owned by the city but operation is contracted out. Entry roads are narrow with tight turn on the exit for my 38 ft 5th wheel. Park is right beside a very nice large city park with plenty of grass and a 2 mile walking path. Operators were great! Extremely helpful in resolving a tire problem also gave me my pick of open sites. It had rained the previous day and sites were soft and muddy withstanding water at each end / needed my 4 wheel drive! Sites had shared utilities so you could have them on wrong side. Park only had 4 other campers so spacing and utilities were not an issue. I got the impression that the park is rarely crowded. Lastly, you can hear the trains! Not too bad if you run your ac all night. We camped at Lafayette Park Campground in a Fifth Wheel. Gothenburg is a quaint small town. See the pony express station and the sod house. As others mentioned, trying to figure out your spot vs the map is a little confusing to say the least. There really is no way to pull in to park. You just go with the flow! However, the couple who manage the park are awesome and very helpful. The park has a wonderful hiking park next to the RV park. The noise - what noise? It was a pleasant stay and would definitely come back to this park. We had wild turkeys outside our door too! Don't miss this gem - it was a lifesaver for us from the wind today. 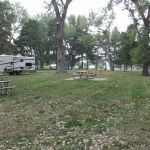 We camped at Lafayette Park Campground in a Motorhome. This is a City Park - can't beat the price. It is very well cared for. Our site was surprisingly level. The water and electric are shared so not on the right side for our hook ups but we had a long enough hose and cord. There are lots of trees so very shady and mostly not good for satellite - but if you park on the perimeter you can get an open satellite shot for Direct TV. The OTA has a few channels the Verizon 4G is good. The people who manage it couldn't be nicer - so very helpful and kind. The bathroom is really old and the showers are separated only by a curtain so not as private as I would like. They are as clean as they can be considering their age. There is a great walking path adjacent to the park - it could be a bit un-nerving if you were to leave your rig unattended for a period of time because you are parked so close to a public walkway where anyone can come or go but it is a small town so probably ok. We chose site #6 and would stay here again if we are in the area. We camped at Lafayette Park Campground in a Travel Trailer. Pony Express Museum is nearby - we didn't have time to visit but we hear it is worth a stop. This park is just fabulous. Awesome owners, extremely friendly and caring. Site 6 was perfect for our 41 ft coach. 15.00 per night is a deal. We would definitely come back to his park if we were in the area. Awesome ! Right next to a creek and covered bridge leading to a beautiful city park. We camped at Lafayette Park Campground in a Motorhome. City run facility located within the town park. 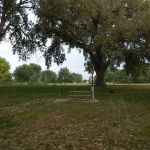 Sites are mostly shaded by large cottonwood trees which were welcome in the hot summer weather. The sites share utilities and are fairly close together. They have gravel or grass and are not clearly defined. The campground hosts are wonderful, engaging people who went out of their way for us. There is a city swimming pool open afternoons in the summer. Campground is north of town about 2 miles off I-80. We camped at Lafayette Park Campground in a Travel Trailer. Gothenburg is a delightful, pretty town of 3,100. It has most services. Check out the Pony Express Museum and City Museum. Good breakfast and lunch at Deb's Diner in downtown. Our 40 foot motorhome was parked in space 28. Easy to access however water and power was on wrong side and had to run under our bus, but this was not a problem. Local TV has only a few channels and satellite was blocked by trees. Very friendly host. Good food nearby in small town of Gothenburg. 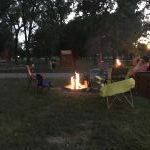 It is right off of route 80 and a nice place to spend the night inexpensively with a big park and lake and many walking / bicycle paths and first Pony Express museum nearby. If traveling through area again we would stay again. We camped at Lafayette Park Campground in a Motorhome. Loved this small campground. It's very quiet. The proprietor and his wife were friendly and helpful. You can tell they work hard to keep it clean and kept up. Bathrooms are rustic yet clean. Everything worked. There's a changing area and two showers. There's free firewood and fire pits at each site. Sites are gravel and some grass. There's a old playground that my kids loved. There's a lake nearby and walking trail. The best part is it only cost $15! I would stay here again. We stayed at Layfayette Park Campground in a motor home. We camped at Lafayette Park Campground in a Motorhome. No complaints at all for a $15/night site! Just a couple miles off I-80. Great spot for a one-night stay with electric and water. There were only two other guests, and they allowed us to pick whatever site we wanted. We circled a couple of times because it's a little hard to see where sites begin and end. We pulled through on a spacious, corner grass site (Site 17) with beautiful, old large trees. Good Verizon cell signal. Easy access to 2-mile walking/bike trail around Lake Helen. Bathroom and showers were old but fairly clean. Two showers with only a curtain dividing them (no door) and bathroom stalls were quite tight. Manager was very helpful and kind. We asked if we could spray the bugs off our trailer cap, and he was very accommodating. We would definitely stay here again. We camped at Lafayette Park Campground in a Fifth Wheel. We were fortunate enough to be there on a Thursday afternoon when the Farmers Market was set up by the Pony Express Museum. This is a pretty nice city park campground with good water and electric utilities. No sewer but a dump station. No WiFi or cable and but a few channels on the antenna. The campground is within a larger city park that is kept very clean with nice walking trails. The gravel roads are in good shape and sites are just grass and some gravel and not all well marked - you just find a power box and water tap and get in however you can. Managers are very friendly. I found it quite quiet at night. Distant train noise seemed to stop at night. The only sounds we heard were a couple of owls. Restroom/showers are old but kept clean but no soap provided for the bathrooms. It is about 2 easy miles through town to the campground. They only accept cash. We camped at Lafayette Park Campground in a Travel Trailer. For the price, this campground can't be beat. We stopped here for just one night on our way out west. While I wouldn't necessarily plan a trip around this park, for a night it works great. As others have mentioned, the sites are very poorly marked and laid out very strangely. Another camper next to us mentioned the same thing. It is hard to see where the sites actually are. When we first arrived at the campground, we were a bit confused, as it was hard to tell we had indeed arrived! I quickly called the cg back (I had called them earlier from the road to see if they had a spot for us for the night). The woman who works there (and lives there as well) was super nice and helpful, and told us she could see us from where she stood. She was very friendly at check in and gave us information about the area. Sites are nice and level, and there are some great paved walking paths right next to the park. As someone else mentioned, there is a frequent train that passes in the night. If you are a light sleeper this may be a problem. We had our a/c on (it was so hot while we were here! ), that it helped drown out the noise a bit. I did appreciate that it was off the beaten path a bit and not right along side the expressway or a busy road, like so many campgrounds are. Even so, it was easy to get to from the interstate. We camped at Lafayette Park Campground in a Motorhome. Very nice city park across the street from the local roping club founded in 1936. I imagine their events are fun. No sewer, very neat and clean. An irrigation channel runs through which you can cross on a covered bridge. It was lonely but, one other camper did show up in the evening. Typical government run park. My wife and I would not hesitate to stay there again. We camped at Lafayette Park Campground in a Motorhome. One museum in an original Pony Express station and another in the Sod house. In addition, there is a city museum across from the Pony Express station. We loved this park! Helpful staff, clean grounds, quiet, and a lovely park to walk in, even a covered bridge! Lack of WiFi or sewer didn't bother us since we were only here one night. Would definitely stay here again! We camped at Lafayette Park Campground in a Travel Trailer. 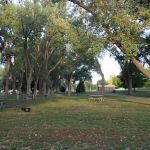 Lafayette Park is Gothenburg, Nebraska's City Park. Our GPS told us we were there - we didn't believe it so called. The manager said she could see us from her office. We were parked across the street from spacious Lafayette Park. The friendly and helpful managers live on site. We were given the choice of any vacant site we liked. Sites were grassy and very spacious. Quiet evenings - with occasional sound of trains in the distance. No Wi Fi. The manager said she recommended it but the city would have to raise the rates to pay for the service and campers happily felt they could do without it. We stayed only one night. It was an enjoyable stay and we recommend Lafayette Park. We camped at Lafayette Park Campground in a Motorhome. Gothenburg is a pleasant town with frontier roots. Take the time to become acquainted with the town, its history, and attractions. The old Pony Express station is a great bit of history and source of information. Water and elect hookups with dump station, very nice folks. Unfortunately the heavy rains contributed to a lot of mosquitoes so could not explore the area around the campground, and the grass needed to be mowed. A nice little town, a few historical sites, lots of trees in the CG. Restrooms were old but clean. Did not use facilities. Would camp here again when the mosquitoes are not so numerous. We camped at Lafayette Park Campground in a Fifth Wheel. A hidden gem! We stayed at this campground while driving across Nebraska. Found it doing a quick google search on the road, and what a pleasant surprise! Staff was friendly and welcoming, the location was clean, quiet, and close enough to walk to town. It is located next to a park which is currently under construction but will be beautiful when finished. It's not your cookie cutter campground, and that's one of the reasons we loved it! We will definitely keep this place in mind if ever passing through again. We camped at Lafayette Park Campground in a Motorhome. Take the walk into town to see the Pony Express station, or walk the loop around the park adjacent to the campground. There is even a cute covered bridge connecting the campground and park. Are you affiliated with Lafayette Park Campground ?